The Maxx Klaxon project is an ongoing satirical interrogation of the psychology of authoritarianism. After the 9/11 attacks, Maximus Clarke began to expand upon a fragmentary alter ego he had first invented as a high school joke: an idealized poster boy for an autocratic regime. As the United States moved into a period of heightened paranoia, he developed the Maxx Klaxon persona as a critique of the political uses of fear. A combination of aspiring dictator and electronic pop idol, Maxx uses music, monologues, and videos to warn against shadowy threats. “Comrade Klaxon” promises his followers protection from enemy mind control… through submission to his own better, stronger mind control. This serves as a multivalent metaphor for terrorism, war, media messaging, hero worship, and other methods of “manufacturing consent”. 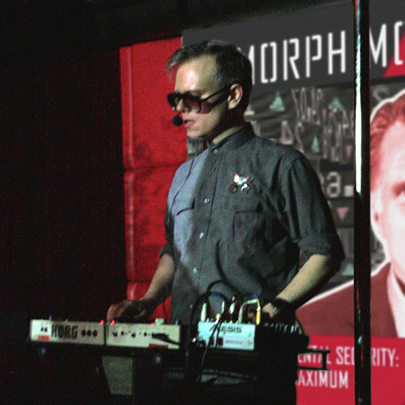 The project encompasses the creation of electropop songs, multimedia segments, and live performances, saturated with the iconography of totalitarianism. Historically evocative imagery and rhetoric serve as means to examine the contemporary realities of life in a nation consumed by an endless and vaguely defined War on Terror.